We offer a variety of motion tracking systems, and we continue to introduce new products, based on market demand. Whether you need to track a person, an object, or several people or objects, we can assist you in determining which tracking system will work best for you. We are the experts in motion tracking and motion capture. Polhemus has been delivering full 6DOF electromagnetic motion trackers for over 40 years. 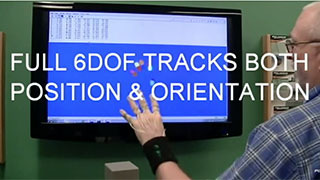 Our highly accurate motion tracking systems have measured the slightest tremor of a Parkinson's patient's hand. What are the most important features you require? Whether you need ultra-fast speed, long range tracking ability, or a multiple sensor system, we offer a wide array of award winning motion tracking systems with options to meet your needs. Our highly accurate motion tracking systems have measured the slightest tremor of a Parkinson’s patient’s hand, the subtle movement on the barrel of a gun, and the swiftest of golf swings by the some of the world’s top professionals. All of our tracking systems have one thing in common: full 6DOF precision tracking that’s reliable, with repeatable results.